For the past several weeks, the news out of Syria and Iraq has been consistent and decisive: The Islamic State is losing ground. Battered by internal rivalries and mistrust, and by powerful attacks from foreign forces as well as various Syrian factions, the one-time future Caliphate is now struggling to survive. Indeed, one ISIS member identified as "Rachid" acknowledged to a reporter from the Independent that as its military gets pushed out of Mosul and Raqqa, ISIS's leaders have determined to preserve what territory they still have, rather than attempt to press further. As ISIS has weakened, the jihadist movement has become less attractive to potential foreign recruits. European – and to some degree, American – Muslim youth, once eager to join the budding Caliphate, willing to leave families behind and even to risk prison should they be caught in the attempt, no longer scramble to be part of what has become the losing team. The Washington Post reported last month that, "from a peak of 2,000 foreign recruits crossing the Turkey-Syria border each month, the Islamic State and other extremist groups operating in Syria are down to as few as 50, according to U.S. Intelligence assessments." But that doesn't mean that those who share ISIS's vision and ideology have vanished. Rather, experts warn, they may simply be planning new attacks much closer to home. Not only that, but foreign fighters already in the Islamic State are likely to want to return to the West rather than risk capture by opposition forces. Already with nothing to fight for and the heroism of a winning battle exhausted, many fighters have deserted. Some have returned to Europe only to execute attacks there, as in Brussels and Paris. Others remain under state supervision, though conditions vary among countries. "A lot of the brothers now feel Mosul cannot be held, Raqqa cannot be held," a jihadist identified as "Rachid" told the Independent. "So the fight is moving to Europe." Europe is rushing to prepare. Those who return through official channels will be arrested at the border; others will have to be hunted down. But the bigger question is: what then? Prisons have repeatedly been shown to be breeding grounds for radicalization; bringing a jihadist fighter into the mix is likely only to create more problems. And for how long can he be sentenced? What happens when he or she is released? Such questions have European officials now looking hard at so-called "de-radicalization" programs that would allow former and would-be jihadists to reenter society safely. There's just one problem: no one really knows what works or, if de-radicalization is even possible. Hence approaches vary, from a Danish system that offers returnees assistance with housing, jobs, and education, to a recently-announced mandatory mental health program in the UK aimed at returnees and those who have indicated support for terrorism. All pursue the same goal: to help or encourage radicals to change their violent behavior and, where possible, their views toward the ideologies that motivate it. Denmark's model evolved from a 2007 program aimed at neo-Nazis. England's new mandatory system is an extension of its "Channel" scheme, instituted in 2006 in response to the 2005 London bombings, which aims at providing early support "to people who are identified as being vulnerable to being drawn into terrorism." But many other countries are tackling the issue from scratch. In France, for instance, an "experiment" was set up shortly after the 2015 Charlie Hebdo massacre – a delayed response to the very real dangers ISIS has imposed on the country. With more than 2,000 French citizens suspected of having ties to terrorist groups in Syria and Iraq, according to an in-depth Foreign Policy report, the country has cracked down hard on returnees and those suspected of plotting attacks at home. Raids post-Hebdo and, even more, following the Nov. 13 Paris attacks, sent dozens to prison. Yet several of the perpetrators of both Paris attacks were radicalized in prison. With the growing understanding that mixing jihadists with the general prison population only helps spread radical ideologies, France briefly adopted the Dutch model – in place since the 2004 killing of filmmaker Theo van Gogh – of "dedicated units" for terrorist prisoners. That approach was recently abandoned, however, when critics argued that this, too, encouraged jihadist networks. Instead, those imprisoned for terrorism will be subjected to harsh conditions "approaching solitary confinement" and face regular searches, according to L'Express. In addition, a program created by the Centre for Prevention of Sectarian Drift Linked To Islam (CPDSI) aims, Foreign Policy reports, "to re-establish emotional security" through therapy sessions, coupled with discussions about extremist ideologies. Founded by anthropologist Doumia Bouzar, the CPDSI claims to have had only one failure among 1,075 clients: a woman who went through the program, then married a jihadist – though she herself does not seem to have returned to violence. Even the Ministry of the Interior was impressed with the results, contracting with CPDSI to run a similar program under their auspices. Conflicts with the government over its decision to rescind the passports of ISIS fighters with dual citizenships, however, led Bouzar to end her relationship with the ministry earlier this year, though her program continues. Meantime, according to Foreign Policy, France has also established a "center for reintegration" staffed with psychologists, educators, and medical practitioners, with classes in laicité [secularism], the arts, conspiracy theories and their background, and pre-professional training. This loosely resembles Denmark's approach, aiming to help radicals re-orient their thinking to become a productive part of French society. Such programs are especially significant in that they provide a counter-narrative to those ISIS recruiters use to attract disenfranchised, angry young men and women, many of whom are believed to form radical groups in search of community and a sense of purpose and belonging. As Bouzar told Foreign Policy, French views of laicité often can "give the impression that you don't have the right to be a Muslim; you have to choose between France and Islam. That's exactly what [ISIS] says." Germany also is exploring similar programs, most notably with Hayat, a program that focuses on Salafists and their families and which, like the Danish program, is based on similar projects working with neo-Nazis; and with the German Institute on Radicalization and De-Radicalization Studies (GIRDS), a research group that advises others on the development of de-radicalization programs. In March, GIRDS was contracted to assist in developing a de-radicalization project in Minnesota, which GIRDS says "has seen the highest number of foreign fighter-related cases in the United States." Unlike many other such programs, Hayat, run by Palestinian-born psychologist Ahmad Mansour, engages preventive strategies as well as corrective ones, and works closely with the families of extremists. Mansour, according to the New York Times, views concerns about the dangers posed by returnees from Syria as "scaremongering." Rather, he argues, many suffer PTSD from the battlefield, or are disillusioned by the reality of life in the Islamic State. While not everyone agrees with this assessment, Mansour's approach of working with the families of radicalizing youth is being echoed elsewhere – not necessarily in de-radicalization centers, but by law enforcement. In the Netherlands, a report produced in part by anti-radicalization group Radar observed that, "Those directly connected [to these youths] have more influence on them than people who are further from them, such as professionals" and that "families often keep contact with their child or family member in Syria." Moreover, Radar notes, those who join the Islamic State form a risk to their siblings and other relatives, whom they may try to radicalize from afar. But this kind of approach is clearly not enough, German officials now say. According to the Wall Street Journal, Salafism is actually on the rise in Germany. And while Germany has not seen the kind of violence that has shaken its neighbors in Belgium and France, a report in Deutsche Welle noted that the country is paying dangerously little attention to prison radicalization. Hence, while Hayat's methods were demonstrably successful in combatting neo-Nazi violence, it is not clear that such programs work quite as well when it comes to radical Islamism. Which may explain why such programs are still floundering in the Netherlands, where Robin Middel, a spokesman for Dutch intelligence agency AIVD described them in an e-mail as "not our cup of tea." "It's better to prevent, rather than to fight, jihadism and radicalization," he added. He is not alone. In an interview, psychiatrist and former CIA operations officer Marc Sageman dismissed the entire concept of de-radicalization programs because "no one has clearly defined radicalization." "Even if people agree on their conception of radicalization, they have no idea how this process takes place in reality (is it indoctrination into a literal Islam and is it related to violence? )," he said. "So when we don't know much about the process of so-called radicalization, what is the reverse process, of which we have even less of an idea?" Even if there was an accepted definition for radicalization, a control group needs to be studied before determining if de-radicalization programs work, Sageman said. "In fact, no country has done this." Sageman is skeptical that any real effort is even being made in this regard. To him, these are "political programs for politicians to claim that they are doing something about the threat to their respective countries when in fact they don't know what they are doing." If he's right, this is frightening. Is this just about creating a false sense of public security? Even in Syria, it turns out, a "rehabilitation center" has sprung up. At an internment camp run by rebel group Jaysh al Tahrir, where some 300 Islamic State POWs and foreign defectors are housed, rebels "try to rehabilitate them and alter their states of minds," Jaysh al Tahrir commander Mohammad al Ghabi told the BBC. The rebels also have helped some foreign defectors make contact with their embassies in order to return home. But not all, he pointed out: "Those who didn't want to go back or had committed crimes are being referred to a Sharia court, which rules by [Islamic] law," he said. Some would likely be executed. For someone like Reda Nidalha, the possibility of a Sharia trial matters. A Dutchman, Nidalha, 22, is among the defectors BBC recently interviewed at the camp. Given the choice between a Sharia court in Syria and the mandatory prison sentence Dutch law imposes on returnees and other terrorist suspects, he said he wants to come home. He is prepared to "pay the price," said Nidalha, who now goes by the jihadi name of Abu Sumail al-Hollandi. "I think ISIS is not the true religion, because they kill people like it's nothing," he told the BBC, his voice muffled behind a scarf that concealed his face. "They use the people like human meat." Nidalha's words sound good, suggesting the voice of a reformed jihadist. Moreover, Nidalha's father, a moderate Muslim, has been active in the Dutch media discussing the problems of being the parent of a jihadist in Syria. He has no illusions about his son and has condemned Reda's extremist views. According to programs like Hayat, Reda Nidalha would seem to be a good candidate for de-radicalization and reintegration into Dutch society. And yet, one can't help but be reminded of Frenchman Adel Kermiche. Earlier this year, after serving 10 months in a French prison on terrorism charges, Foreign Policy reports, Kermiche described himself to a judge as a "Muslim who stands for the values of mercy and benevolence" who wanted to "get back to my life." Only months later, he and an accomplice entered the church of Saint-Etienne du Rouvray in Normandy, forced 85-year-old priest Jacques Hamel to kneel at the altar, and slit his throat. And so Europe faces an ever-more urgent dilemma: lock up returning jihadists for life – even those who didn't actively engage in terror? Keep them under monitor? Attempt to rehabilitate them, in the hopes that they can, indeed, "live life normally" as productive members of the community, sons and daughters back in the arms of their parents, prepared, like former al-Qaida recruiter Mubin Shaikh, to fight the scourge of radical Islam as no one else quite can? Even if we can't be sure these programs work? And yet, as Lorenzo Vidino, director of George Washington University's program on Extremism, observed to the Wall Street Journal, "What's the alternative? Police can't monitor them all, so even if a program is successful in only 30 percent of the cases, it's still better." True, it's a big "if." 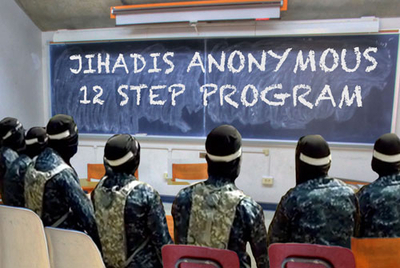 For the moment, de-radicalization programs seem to be our best hope, and our most humane one. But we will need to work much harder to be sure we get it right.